In addition to early stage startups, I also work with established technology companies. Beyond size, one of the more striking differences I see between the two is their approach to planning. In the case of the latter, most have some formal process for strategic planning. But for some reason, in early stage companies, strategic planning is a dirty term. "The market's moving too fast for us to worry about that!" "By the time we'd get done with a plan, it would be obsolete." Or the one I hear a variant of all the time: "When I was at Giganto Corp, we used to waste weeks putting together these huge binders and massive slide decks that were complete bull**** and ended up on the shelf. No way am I going to...." followed by a tirade against big company bureaucracy. Unfortunately, by rejecting any semblance of strategic planning, many startups are throwing out the baby with the bathwater. As a result, many of them become completely reactive. In their quest for traction, they knee jerk with every shift in the market and call it "pivoting." They end up wasting time, money, and energy achieving nothing. The last time I checked, "flailing" wasn't a synonym for "pivoting." So how would having a strategic plan help? That's it. All the fancy frameworks - Five Forces, SWOT, Portfolio Matrix theory, etc. - are merely mental aids to help one think through and to pinpoint what data is needed the answers to those two questions. Don't get me wrong; this doesn't mean it's not work. But most of the work is collecting data and forging consensus, which always takes work. Strategic plans are long, elaborate documents crammed with data - Wrong. In my experience, a good strategic plan should fit on a single 8-1/2 x 11 sheet of paper with at most 3-5 bullet point initiatives, their relevant metrics (can be qualitative as well as quantitative) for evaluating progress, and a list of key assumptions (also bullet points) underlying the plan. The rest is an appendix. In my mind, the major benefit of a strategic plan for a startup lies in the assumptions. If a key assumption has changed or cannot be validated, the startup needs to know why. Only then can it decide if or how to react. A change in key assumptions, either external or internal, should be the only reason a startup "pivots." This is completely in accordance with the data driven learning philosophy championed by Steve Blank's customer development methodology and the lean startup movement. Planning is not the enemy of learning. The diagram below shows how and where a strategic plan fits into overall business planning and management. 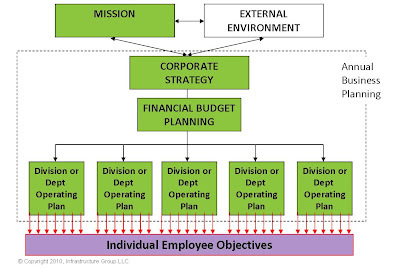 A strategic plan flows from two things: mission (the vision for the company) and the external environment (i.e. market trends, competition, customers, etc.). Most entrepreneurs have the former. The latter is where most of the data collection work will be. Once a strategic plan is developed, it should be integrated into the company's financial budget process with strategic initiatives broken down into individual business unit operating plans. These, in turn, should be turned into tactical performance objectives for each employee. In my experience, the main reason strategic plans fail to get implemented is because they are never integrated with the company's performance review process and not driven into individual employee objectives. Managers should touch base with employees on progress to these objectives at least quarterly. I learned this the hard way during my first turnaround at Luxtron. To my surprise, it became apparent early on that there was nothing wrong with the former management's strategic plans. Even more mystifying, while there were operational problems here and there, overall the employees were doing a good job of task execution. Where the company was failing was in implementing the strategy because strategic initiatives had never been linked to individual employee objectives. In other words, while the strategy was fine and the employees were executing their tasks properly, the tasks weren't the ones needed to drive the strategy forward. They think they don't know how or that the benefit isn't worth the effort - Hopefully, this post has dealt with this reason. Just try to answer the two questions above and keep it to a page showing (a) 3-5 initiatives (b) associated metrics (c) key assumptions. Action is more compelling than thinking - At the risk of stereotyping, most entrepreneurs are heavily biased towards action (in some cases to the point of having ADHD). While there is something satisfying about having met six potential customers, finishing that block of code, completing the website copy, and interviewing two new engineers all before lunch, sitting at a desk jotting down a note or two while you think doesn't quite have the same adrenaline rush and, in fact, feels downright lazy! But action is not equivalent to effectiveness. This is only true if you're doing the right things, which is what strategy is all about. They overestimate how well the team is aligned - While it's true that goal alignment is tougher in a company of 500 than with a three person team, don't assume that because the three of you all work in the same 100 sq.ft. closet, you have goal alignment. My challenge to startups without a strategic plan: Schedule a one hour strategic planning meeting. If you and your team really understand what needs to be done, then you'll have that 8-1/2 x 11 sheet finished inside the hour and can then get on with building your business. Congratulations! But if you're still there after 90 minutes, maybe that should tell you something.